Definition at line 15 of file CREAnimationPanel.h. Definition at line 14 of file CREAnimationPanel.cpp. References myAnimation, myDisplay, myFaces, and myUsing. Implements CRETPanel< const Animations >. Definition at line 37 of file CREAnimationPanel.cpp. 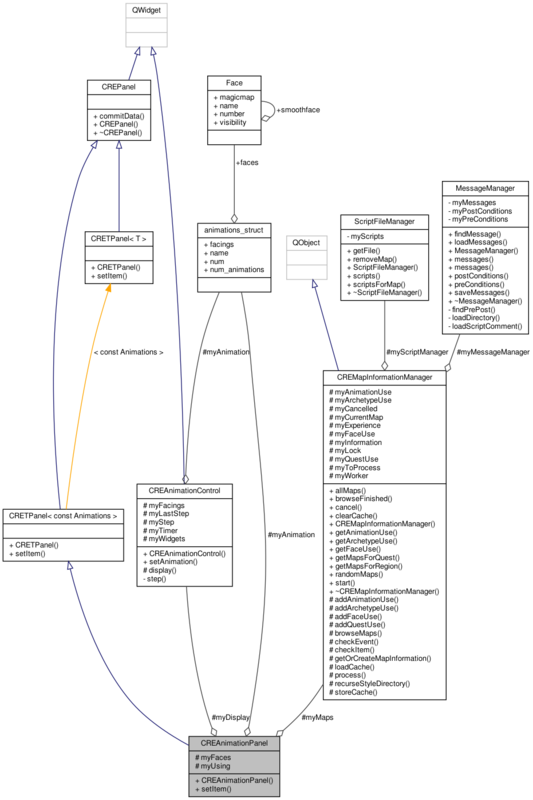 References obj::animation_id, CREUtils::archetypeNode(), CREUtils::artifactNode(), archt::clone, CREUtils::faceNode(), animations_struct::faces, first_archetype, first_artifactlist, artifactstruct::item, artifactliststruct::items, archt::more, myAnimation, myDisplay, myFaces, myUsing, animations_struct::name, artifactstruct::next, artifactliststruct::next, archt::next, animations_struct::num, animations_struct::num_animations, object_get_value(), root, and CREAnimationControl::setAnimation(). Definition at line 24 of file CREAnimationPanel.h. Referenced by CREAnimationPanel(), and setItem(). Definition at line 28 of file CREAnimationPanel.h. Definition at line 27 of file CREAnimationPanel.h. Definition at line 26 of file CREAnimationPanel.h.